Pro Flaps mud flaps are for the serious truck enthusiasts. Pro Flaps mud flaps are Longer, wider and stronger than any other mud flap on the market. Mud flaps keep rocks and debris from scratching your ride. They also prevent damage to boats and trailers you may be towing and random cars that are following you to close. Pro Flaps makes mud flaps for Ford, Chevy, Dodge, GMC, and even Toyota pickups. Pro Flaps mud flaps are the best mud flaps on the market hands down! If you have a lifted truck that you have to check out these flaps. The frame mounted flaps are easily attached to the frame of your vehicle and hang directly behind the wheels on your lifted truck. These mud flaps look better than your average flap because they sit lower. This eliminates the need for a 36" long mud flap if you have a big lift. Pro Flaps mud flaps feature heavy duty 3/8" polyurethane flaps. Each mud flap comes with anti-spray design with vertical ridges. When installing these mud flaps use non rust, galvanized support brackets. Pro Flaps mud flaps come in plain or with stainless steel anchor weights. 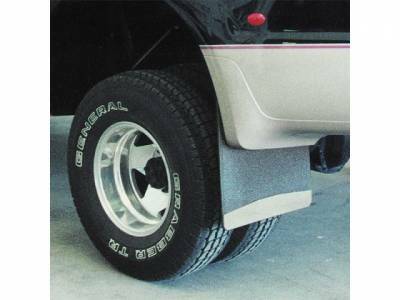 Get the same type of wide-coverage mud flaps on your truck as those used on large semi-trucks. Pro Flaps are made of fade-resistant heavy-duty 3/8" polyurethane with an anti-spray design that incorporates vertical ridges so water will drain down and not out. They attach to your truck using galvanized support brackets that will not rust. Mirror-finish stainless steel weights add a custom look. Vehicles must have a minimum of 7" of clearance from the bottom of the Pro Flap to the road surface. Includes all mounting hardware.